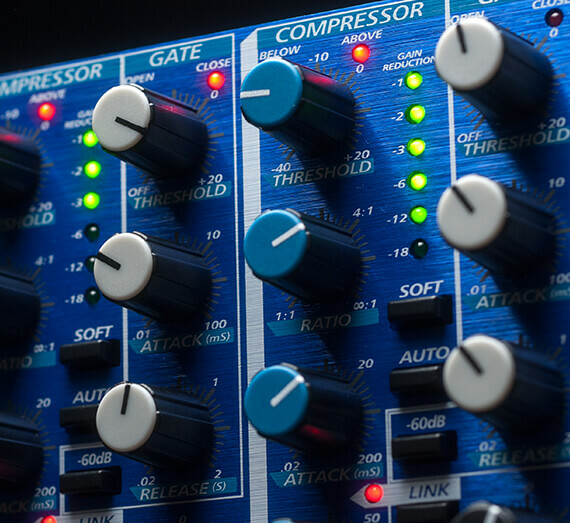 One of our all-time most popular products, the ACP88 delivers the classic analog compression that helped establish PreSonus as a leading signal-processor manufacturer. With eight independent, linkable, full-featured compressor/limiters and gates, each of which can operate at either +4 dBu or -10 dBV, the ACP88 can solve a host of thorny studio and live-sound problems. Each channel can be independently bypassed so you can audition signals with and without processing. And you can see at a glance what’s going on, thanks to a six-segment LED gain-reduction meter and pair of LEDs that indicate gate position (open/closed) and compression threshold (above/below). With top-shelf components and classic analog design, it’s no surprise that the ACP88 delivers best-in-class audio quality. At the heart of the ACP88 is the highly respected THAT 4301s VCA. This VCA has unsurpassed dynamic range, extremely low distortion characteristics, and virtually no noise. Who says they don’t make signal processors like they used to? Nonsense! A fully variable compressor with the works. Each of the ACP88’s eight independent channels has a fully variable compressor with a sidechain send and return to enable spectral processing and ducking. In addition to the usual attack, release, ratio, threshold, and makeup gain controls, each compressor offers selectable soft- or hard-knee compression and an Auto Attack feature that applies preprogrammed Attack and Release curves. In short, you get all the parameters and features you expect from a high-end compressor—and we’re just getting started. Each channel of the ACP88 has a dynamic noise gate after the compressor/limiter that can be used to gate an entire drum kit, isolate an instrument, or separate a vocal from background noise. Each gate has attack, release, and threshold controls; a gate-range switch, which determines the amount of level reduction that occurs when the gate closes; and a sidechain/key insert loop that enables the gate to be opened, or “keyed,” in response to a modified version of the program signal or some other external source—great for de-essing, ducking, frequency-dependent gating, and much more. You can’t do this with most dynamics processors. With eight independent dynamics processors in one unit, you can employ tricks that aren’t possible with lesser processors. In particular, the Channel Link feature lets you lock together as many channels as you wish, so that all processors follow the setting of the master processor. Since you can create multiple simultaneous link groups, you could link a stereo pair of channels plus a group of four processors and still have two unlinked channels for other applications. Great old-school processors never get old. A superb old-school processor, with physical knobs and switches for every parameter, shoehorned into two rackspaces, the ACP88 delivers a pure analog sound that will always be in style. So if you want a professional analog dynamics processor that is every bit as powerful and sonically pleasing as the famous vintage processors were “back when,” go to your favorite PreSonus dealer and check out the ACP88. Because great sound never gets old.